Alex Baird is an artist based in West Pymble situated on the North side of Sydney. She studied fine art as a youth and won the junior Mosman art prize at the age of 16. She then went on to do a diploma in graphic design and since then she has been supporting herself as a graphic designer running a small successful business Alex Baird Design. More recently she has been concentrating on her love, painting, and is very busy with commissions. She combines her passion for art and her understanding of the commercial world. Alex held her first solo exhibition at the Oyster Bar on Sydney’s Harbour at the age of 20 in 1992 which was very successful. Since then, she has held several exhibitions and been involved in over a dozen group exhibitions. The subject matter for Alex’s work artwork generally depicts the vibrancy and magnificence of Sydney Harbour and its stunning beaches. Alex’s Influences are predominantly impressionists such as Lloyd Rees, Van Gogh, Matisse and Brett Whiteley. 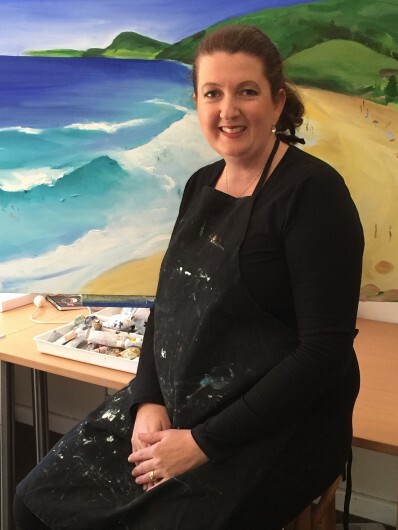 She loves to paint the ocean, Sydney’s Harbour and its stunning curves which has been a feature in most of her pieces. Alex’s favourite medium is oil paint as it allows for expression in her work and brings out a vibrancy in her paintings. She is represented in corporate and private collections throughout Australia. If you would like to commission a painting, that is something I do on a regular basis. Clients will often have a special place or view they would like painted and it can be a fantastic gift for someone special. The process for doing this is that I would have an initial meeting with you to see what type of painting you are after ad the size. I either do this in my studio at West Pymble or at the destination that is going to be painted. If you are not able to meet that is not a problem, you can just email me a photo of what you are after or I can go on site and take a range of photos to work from. I take a 30% deposit and the painting is usually ready for collection within 3 weeks as it needs time to dry. The cost of the painting depends on what size you order. If you let me know an approximate size the painting will be I can email you a quote. If you want to get in touch with me for a painting commission, please either phone 0425 208 014 or go to my contact page and send me an email.